Are you ready to be a winner?! Play Fairytale Fortune for your chance to win exciting prizes! There are loads of exciting features that makes this game extra special and extra fun! To find out, just spin the reels and see what you’ve won! 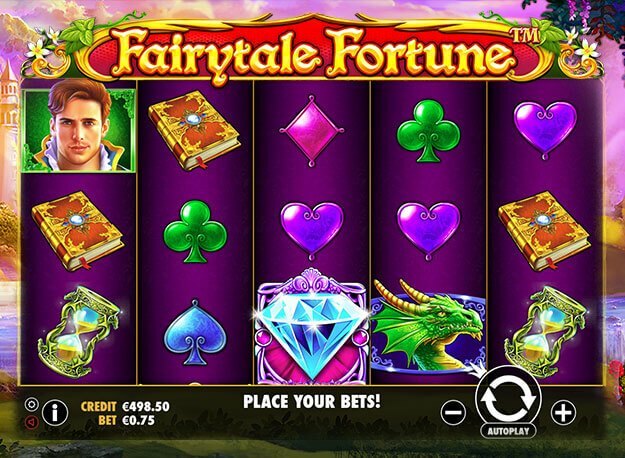 Fairytale Fortune Slot is a 5 reel and 15 payline slot game, themed on an old folk of a princess who was kept hostage by a monstrous dragon! Prince charming now sets out on an adventure to rescue her, and you are to accompany him at Gossip Bingo - the best online bingo site! On the reels of this enchanting and romantic slot game that Pragmatic Play brings to you, enjoy symbols like; prince charming, princesses, dragons, unicorns, spell books, hourglasses, hearts, clubs, spades, diamonds and Fairytale Fortune Logo which land on your reels to form winning combinations! To access the bet and bet levels tabs, toggle the plus or minus button and set your preferences. After having adjusted your stakes, click on the Spin button to start your gameplay! Autoplay is at hand, and enables you to set your game to play handsfree! Amount of Paylines Selection: Payline amounts are fixed and cannot be changed. Coin Values: Bets range from the lowest value of £0.01 to the highest value of £0.50. Wild takes form of the Fairytale Fortune Logo, which alternates for all other symbols bar the bonus symbol. Wheel of Fortune: Win multiplier values of 5x, 10x, 20x, 25x, 30x, 35x, 40x, 45x, or 50x+1 free spin. Landing on 50x + 1 free spins award you one more spin on the prize wheel. Raining Wilds: Ten free spins are awarded, and raining wilds are randomly placed on the reels from spin 3 to 10. Super Wild Free Spins: Ten free spins and one Super Wild Free Spin are awarded. For the first ten free spins, up to 15 wilds hit the reels. Progressive Free Spins: Ten free spins are awarded. Collect points to advance through five consecutive levels. During the gameplay, Rose symbols appear and award one point for each. Manage to collect 20 symbols and head over to level 5 where stacked symbols appear on all reels.